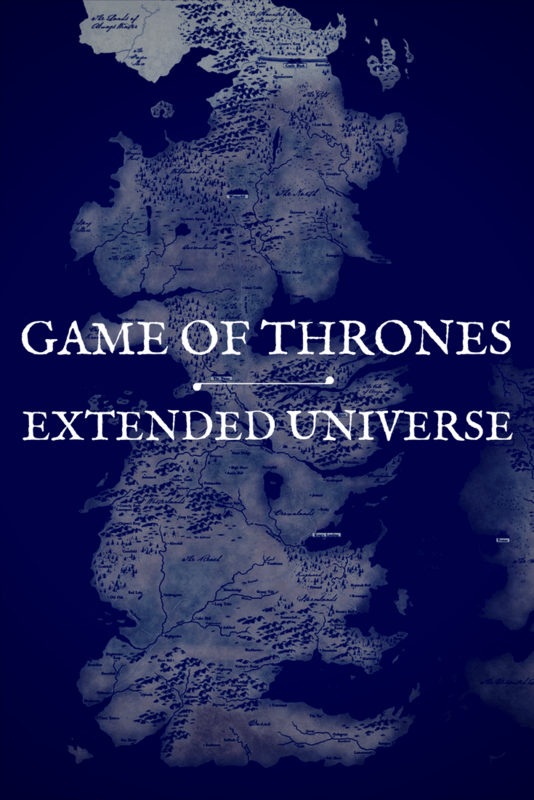 The Game of Thrones extended universe can tide you over when you’re missing the world of Westeros. Here’s a rundown. Just ask any Harry Potter fan, the books offer a completely different, far richer world than the movies. By now, viewers have noticed that in George R.R. Martin’s universe, there are no small parts. One particularly observant dancing master can change the course of someone’s life in the Game of Thrones extended universe. The Game of Thrones books are 1,000-page tomes bursting at the seams with world building and interesting characters. The TV show would have needed 20 seasons to actually cover all the stuff in the book. And the length of the books sounds more intimidating than it actually is. Martin is an amazing writer who grabs you by the scruff of the neck and drags you through his books (except for Feast of Crows, which can be a bit of a slog). By the by, I think the Game of Thrones TV series is every bit as good as the books. To return to the Harry Potter universe I mentioned, the movies actually improved dramatically when they stopped trying to completely re-create the books and started to tell the story cinematically (Harry Potter and the Prison of Azkaban, for instance). The genius of the Game of Thrones TV series is distilling the story down to its essential elements while still keeping a lot of the world building. On a different note, it’s very interesting from the “logic of narrative” standpoint to see how minor changes in, say, Season 1, will cascade into huge changes by Season 7. For instance, if a character dies on the TV show, but doesn’t die in the books, that character could be doing important things later in the books, but they can’t do anything else on the TV show. For example, Rob Stark’s wife is killed on the TV show, but not in the books. So, we will probably see her again in the books. She might even have a moment. Without going too far into spoilers, that’s why Brienne fights the Hound in the show, but not the books (although of course, that could be coming in Winds of Winter). Ever heard of Dunk and Egg? A hundred years before the events of the Game of Thrones series, Aegon Targaryen, the prince of the seven kingdoms, learns lessons and sees how real people live as an anonymous hedge knight’s squire. A Knight of the Seven Kingdoms is a collection of three Dunk and Egg stories from the Game of Thrones extended universe. It doesn’t really relate to the events on the TV show, but there is a crossover character. Dunk’s little brother, Aemon Targaryen, who is Maester Aemon from the Night’s Watch, is a baby in the stories. The only mention of Dunk and Egg in the Game of Thrones TV show is when Maester Aemon is dying and he brings up his brother, Egg. But the TV show is always quoting events from the Game of Thrones extended universe and the Dunk and Egg stories have a lot of the Targaryen history, specifically the Blackfyre rebellion when Targaryen fought Targaryen. This is a new thing that I haven’t actually read, but it’s a “hypertext” version of the Game of Thrones books. Don’t know who someone is? Click on their name! Don’t know where they are? There’s a map! These are only available on iBooks, but it’s a great idea. For the people who are intimidated by the idea of a long novel with thousands of characters, these Game of Thrones books can help you navigate the world with ease. Scratch a successful fantasy or science fiction series and you will find scads of supplemental materials. I myself own the Star Wars blueprints in case I ever get the resources together and want to build myself an accurate Death Star. But the difference between most fake reference books and the Song of Ice & Fire reference books, is that The World of Ice & Fire: The Untold History of Westeros and the Game of Thrones was actually written by George R.R. Martin. He jokingly refers to this part of the Game of Thrones extended universe as the Grrmillion, a reference to J.R.R. Tolkien’s Silmarillion, which contains a bunch of stuff that happened in the past instead of a narrative. Martin is a huge Tolkien fan and loves this kind of thing. Basically, this Game of Thrones reference book is a fake history book of Westeros with beautiful illustrations. I am in the minority on this one, but when cold winds blow on Westeros, I feel like the streaming video lets me down, pixilating on the snow. The whole zombie bear scene was like a primer on the drawbacks of streaming video. At these moments, I reach for the Blu-ray. But a clear picture is not the only reason, because the Game of Thrones Blu-rays are stuffed with documentaries, some of the most entertaining and enlightening commentaries in the business, and all kinds of bonus features that don’t feel like the filler on most DVDs. Watching some of the extras really helped me understand the finer points of how the TV creators, D.B. Weiss and David Benioff, were really, really thinking about how to get this rich, cultured world of the books to the TV screen. Obviously, the Game of Thrones audio books are just the regular books, except a guy named Roy Dotrice does an excellent job of reading them. He brings the audio books to life with literally hundreds of different voices. Roy played Pyromancer Hallyne, the creepy guy who liked it when things burned, on Game of Thrones. Interestingly, Roy is actually in the Guinness Book of World Records for the highest number of individual voices in a single audio book at 224. It’s kind of a weird record, but these audio books are perfect for listening to on walks, at the gym, doing the dishes, binge eating Doritos or whatever your thing is. As a guy who loves comic books, I don’t really love the Game of Thrones comic book adaptations, because I already have them in a few other mediums. But who knows? In a few years, the comic books might be a new way to make this story fresh. Finely adapted and illustrated, of course. I have a passing interest in maps. In Conan the Barbarian books, the map of Hyboria always helped me to figure out what country Conan was in and how it was… well, I guess we all know how maps work. Martin is a self-professed map geek, so the maps of Westeros are, let’s just say, more detailed than the Conan map. If you’re the sort of person who likes to figure out where the characters are going to and from, this is the book for you. I think the existence of these Game of Thrones maps led directly to the nitpicks of Season 7, when people were mapping out how fast Gendry could run and how long it would take him to get back to the wall. And hey, if you’re just reading this article because you want to buy a gift for a Game of Thrones fan, HBO has t-shirts and all kinds of stuff. I personally have a pint glass collection. And Martin puts a lot of thought into his Game of Thrones calendars. And there are a few gift books, like The Wit and Wisdom of Tyrion Lannister leaps to mind. Thanks for reading! Sign up for our newsletter to get a free Guide to 75 Binge-Worthy TV Shows. I know right? Never too many books.